STURGEON BAY, WI (April 30, 2018) – Oldcastle Precast has recently taken delivery of a pair of Shuttlelift DB (Double Beam) Series rubber-tired gantry cranes for their operation in Perris, CA. The two DB 90 (180,000 lb. capacity) mobile gantry cranes also feature custom spreader assemblies which allow them to lift a wider variety of products and handle future needs in the transportation market. Oldcastle Precast is a premier provider of engineered building product solutions and services for North American infrastructure projects. They serve a number of markets nationwide but the primary focus at the Perris, CA facility is precast/prestressed bridge girders. A company as well respected as Oldcastle does not get where they are without keeping close tabs on market trends and what that means for future growth. With the wide range of projects they work on, and the ever-changing size and length of components, they needed mobile gantry cranes capable of handling a variety of products while providing long-term value and reliability. 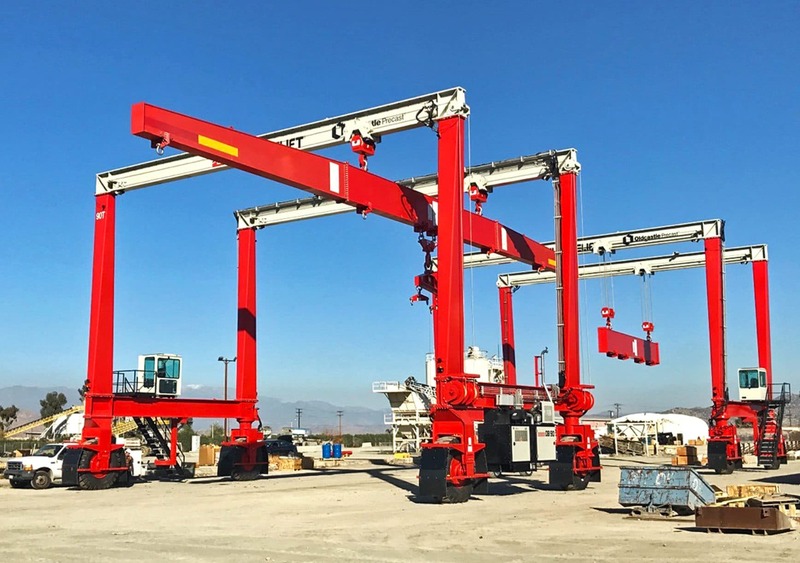 “The investment in the two Shuttlelift DB90 gantry cranes allows us to lift a wider variety of product and has given us the versatility needed to become more efficient in our staging and loading area,” said Scott Hicks, Site Manager at the Perris facility. “The added capacity, along with the quality and reliability of the Shuttlelift cranes, is something we didn’t have with our older off-brand gantries,” added Hicks. The team at Shuttlelift worked with Oldcastle right from the beginning to make sure the DB90 mobile gantry cranes would not only benefit current projects but also projects well into the future. To make this happen Shuttlelift engineers designed a custom spreader assembly to maximize the versatility and allow the cranes to work independently or in tandem. The new rubber tired gantry cranes are also equipped with many features and options to help with ease of operation and maintenance. The cab is mounted on the lower side beam opposite the engine compartment with a custom stair system to make entering and exiting the cab as effortless as walking up and down a flight of stairs. Low mounted hoists, linkage-less steering, and the ever-popular remote diagnostic feature all help to keep maintenance costs down while maximizing production time. Oldcastle Precast is already realizing the benefits of the new Shuttlelift DB90 rubber tired gantry crane. With a durable and maintenance friendly design, and reliable engineering and service support, the Shuttlelift gantry cranes will aide in the continued success of Oldcastle for years to come. “Having a crane that provides long-term value, is built tough and has premium service support is critical to performing our work safely and efficiently, while providing a quality product,” stated Hicks. For more information about Shuttlelift and its full range of rubber-tired gantry cranes, email the sales team at sales@shuttlelift.com or visit www.shuttlelift.com. You can also follow on Facebook, LinkedIn, and Twitter for the latest news and updates. Shuttlelift rubber-tired gantry cranes are the preferred customer-inspired solution for heavy lifting requirements and are manufactured to specification for a multitude of applications, worldwide. The Sturgeon Bay, Wisconsin USA-based company manufactures cranes with capacities ranging from 30 to 1,000 U.S. tons and greater, all of which are supported by a global network of experienced dealers. Through superior engineering innovations, Shuttlelift has become one of the premier lines in today’s material-handling industry.